MG's signature pre-intra-post workout formula! Massive G brings you the ultimate Pre-Intra-Post workout formula in MG's Powdered Muscle! When you train like Massive G, you your body requires a constant stream of nutrients to fuel those heavy gains. MG's Powdered Muscle is an all-in-one mix that can be consumed in equal parts before, during, and after your workout to replenish vital protein and carbohydrates. As a dietary supplement, MG's Powdered Muscle may help to support muscle-building and increased energy throughout your workout! As a dietary supplement, take 1 Serving (2 Scoops) and mix thoroughly into 16-24 floz of water. Consume in three even portions, taking the first third pre-workout, the second during the workout, and the final amount immediately post-workout. Whole Oat Flour, Peptopro® Hydrolyzed Caseinate (Milk), Natural Flavors, Ascorbic Acid, Sodium Chloride, Citric Acid, Malic Acid, Sucralose, Magnesium Aspartate. CONTAINS: MILK, WHEAT. This product is manufactured in a facility that handles milk, soy, egg, peanut, nut, tree, fish, crustaceans/shellfish, and wheat products. Definitely a solid product. It would be great if this could be instatized so it mixed with a less chalky texture and quicker digestion. 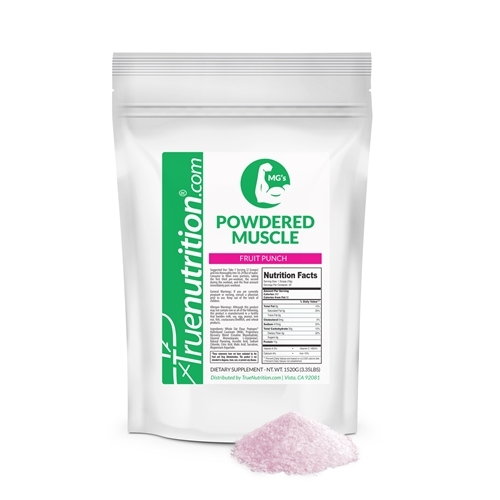 As someone who really dislikes fruit punch flavors, TN's MG's Powdered Muscle is really tasty - its fruity, but doesn't have that classic 'punch' taste that I find so unappealing. Flavor aside, this product fuels my workouts from start to finish and aids in my recovery. I really don't like lifting without it! Awesome, awesome formula. Noticed reduced doms and improved performance within the 1st week. Thanks TP and MG!